I have been spending like crazy throughout this month. Every few days, gave a few online orders. Been going crazy !!! All this stuff was ordered online (it has become my favorite mode of shopping ever). 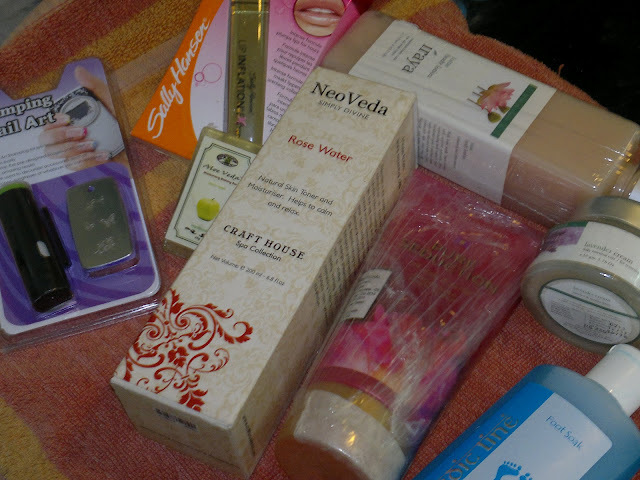 From urbantouch, I hauled Konad Stamping kit, Neoveda Rose water, Sally Hansen Lip Inflation extreme, Iraya Lavender cream and Iraya Body Lotion. Got a free sample of Alow Veda soap, smells divine. Goodlife is stocking Victoria Secret and B&B products as well, I ordered a scrub from VS and a foot soak from Vedic Line. Hope you enjoyed my haul. Stay tuned for lots of reviews!!! Exciting haul you have here :) Can't wait for the Sally Hansen Inflation extreme review !! Thanks Swathi, review for Sally Hansen Lip Inflation coming soon!!! DO a review of Iraya products I want to have a look at them...... How much do they cost?